High-scoring Denair High guard Isaac Starks was the runaway choice for Southern League boys basketball Most Valuable Player. Starks, a senior and three-year varsity starter, led the league in scoring at 24 points a game. That was the ninth-highest total for any player in the Sac-Joaquin Section, which encompasses 197 schools between Sacramento and Merced. Starks thrived despite constant attention by opposing defenses, who tried a little bit of everything to slow the 5-foot-11, 160-pound sharp shooter. Starks scored 20 points or more in 21 of Denair’s 26 games and was held below 10 points just once for a team that finished 10-16. Starks is being recruited by four community colleges – Merced, Columbia, Cabrillo (Aptos) and College of the Desert (Palm Desert). He expects to make a decision before graduation in May. While he contemplates his next school, Starks will have multiple opportunities to showcase his skills. On March 24, he joined seniors from 10 schools in the 2nd annual Central Valley Senior Showcase at Pitman High School in Turlock. With Henderson as his coach one final game, Starks scored 15 points as his National team defeated the American squad 100-85. 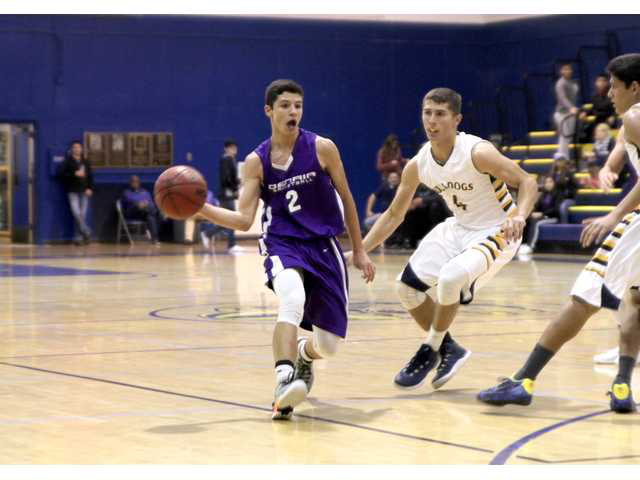 Saturday, he will play in the Madness in the Mother Lode game at Columbia College. And later this spring, he will be on one of the teams in the Six County All-Star Game in Modesto. Posted in News and tagged basketball, Denair High School, MVP.